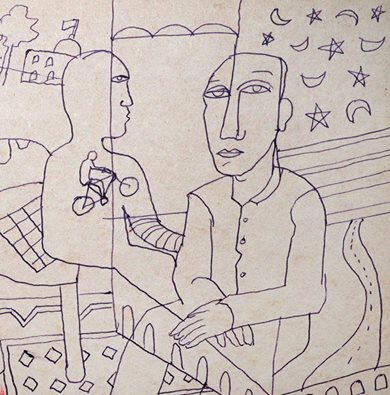 As part of ‘Drawing Documents’ a four part series examining the multifaceted qualities in drawing, Moeen Faruqi’s exhibition ‘Other Selves’ was the second show from the project which relayed a collection of his sketches over a period of years. The understated display at the IVS Gallery with tapes attaching sketches throughout the walls, conveyed a sense of invaded privacy as the sheets are all snippets from the artists’ personal sketchbooks flared out in the open – like laundry for all to see. However the simplicity and casual nature of the exhibition extracted that all too familiar stiff formality one feels as they enter a contemporary art gallery. The viewer could suddenly let a sigh of relief go and hover as close as they would like towards the display. Drawing Documents is a continuing project designed by Seher Naveed which will result in a publication compiling and investigating the interpretation of the meaning behind ‘drawing’ for four artists. The artists have been introduced and partnered with four writers who will aim to respond to the visuals through text in limitless directions. While this is of course an unusual project in Pakistan’s art circle, it is more unusual to see the importance being placed upon drawing as a source of inspiration behind collaborations and storytelling. Perhaps this is the true power of drawings and sketches – it may be the first unconscious stage of putting together a composition for artists, but it’s a universal language used and understood by many who are not just in the visual arts field. Partnered with curator and writer Zarmeene Shah for the Drawing Documents publication, Moeen Faruqi sits down with us and shows us around his studio while speaking about Other Selves and his thoughts on the show. Veera Rustomji: Tell us about the initial stages of the collection for Other Selves. Moeen Faruqi: Well, there have been two shows from this series, Suleiman Khilji and then mine. However, my work wasn’t made for this show and that was pretty much the point, some of them were even ten years old. I wasn’t clear over what I wanted to exhibit but then Seher came with me, we sat and went through the numerous strewn sketches I have made and even I was surprised that so many drawings came out. The show was very informal in that way, they’re not framed products, and we took them straight from the sketchbooks to the gallery space. (Laughs) Actually I’m not sure that I’m comfortable exhibiting them because they were never made to meant to be exhibited! VR: What about the prolific amount of writing and scribbles in the collection? There are poems and speech bubbles and sometimes you’ve drawn over a printed piece of text. Are these intentional practices? MF: Writings are in a way sometimes the drawings themselves. I enjoy writing; it’s the act of writing really, as I don’t really care about what I’m writing per say. I have these sets of fountain pens and I just keep doodling around with them – as I said there wasn’t an intention on displaying them, they’re really more like pages from private notebooks. There’s a poem about the sea and sometimes the characters are sitting in these slightly awkward positions and there is an obvious artificiality to the setting but the text is just an extension of these situations. VR: What is your interpretation of drawing being used as a research tool? 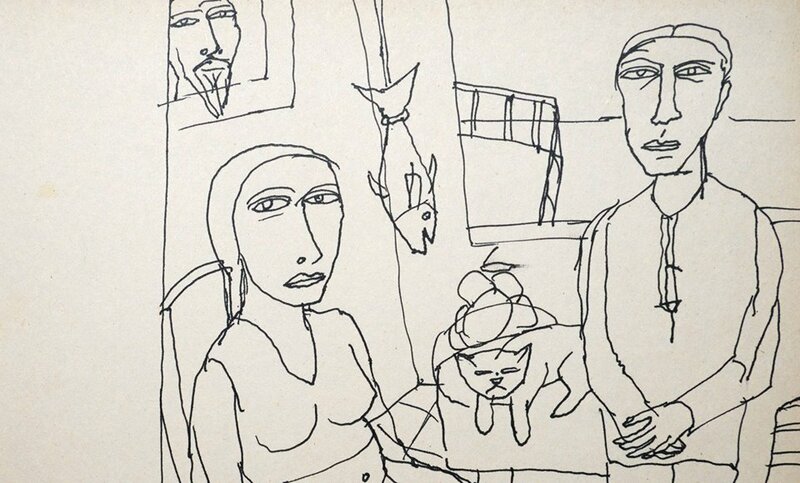 MF: I draw regardless, some of these drawings- very few of them were converted into paintings –are not finished pieces of art, they’re pictures that hint at my private doodling. It’s something instinctive which I guess can be termed as a primary stage of research. But yes, through drawing, I keep perfecting their form and trying to make the characters better. Then while revisiting them I pick something up that was never meant to be in a painting and put them or convert into the intended painting. If they (the characters) are meant to be realistic, I’ll use photographs and magazines but if they’re imaginary, I’ll just do it myself. They’re not really references to people I know but of course, in a way, they reflect the people and society around me. I think the drawing classes I took with Irfan Hasan helped a lot – I wish I could have done more, a class gives you discipline. I never went to art school so I’m really fascinated by realistic painting; I keep trying to improve my own painting. I learn something new every day and sometimes I reference from classical paintings like the renaissance paintings. I think drawing especially for figurative art is especially essential. VR: How was it different from an oil painting? MF: It was a little uncomfortable! I didn’t find them particularly attractive, because it seemed a little indefinite- but I think it’s refreshing that people can see what an art process is like, from this point of view. VR: Are there any key words in the writings? There are a lot of similar phrases and words repeated. MF: (Chuckles) They’re not meant to say anything. I’m just practicing my English calligraphy if that’s a way of putting it! VR: Is there a correlation between the text and the image? MF: I don’t think there’s a literal connection, I just enjoy the process of writing but in some cases I have written some poems so I am scribbling about an image. At the same time I’m writing about the characters and what they’re saying or the conversation over the dining table… you can see the fish is saying mujhey maaf kardo in between two humans on a table. I’m constantly personifying animals and I think the best explanation about the fish is that I feel like fish out of water. The feeling of alienation… the cat too is very human like- it’s one of those creatures which have such human characteristics. Ironically, I’m not comfortable with animals. It’s not that I don’t like them – there is a dog in my drive way, but he’s just there as a guard dog- I don’t really bring him in! VR: Your work for Other Selves is a step away from realism and the display with the frayed edges from a sketchbook adds to this informality – do you think you would try something new next time? MF: Yes, the notebook effect is very much there, and I wouldn’t usually see my work ‘displayed’ like that. Seher deliberately kept the punch holes in the paper. You can see around my studio, (points to desk and stacks of books that have numerous sketches sticking out through the pages) that there are drawings tucked away in magazines and museum books. This (studio desk) is where I do my research and drawing, (I prefer to paint on canvas cloth on board, so that there’s no spring!) When it comes to painting or even drawing –there has to be a point in painting photo realistically, but you have to put in your own editions and language. My opinion is that you can’t just translate things as they are and sit back. My recent paintings at Canvas Gallery were quite realistic, but I still use certain colours I like which aren’t a literal interpretation of the skin or clothes or textures. I just think an artist should be bringing something new to the table.